Team Administrator, Dayo Enebi delivered the gift to Ikeme who is presently undergoing chemotherapy having been diagnosed of acute leukemia. 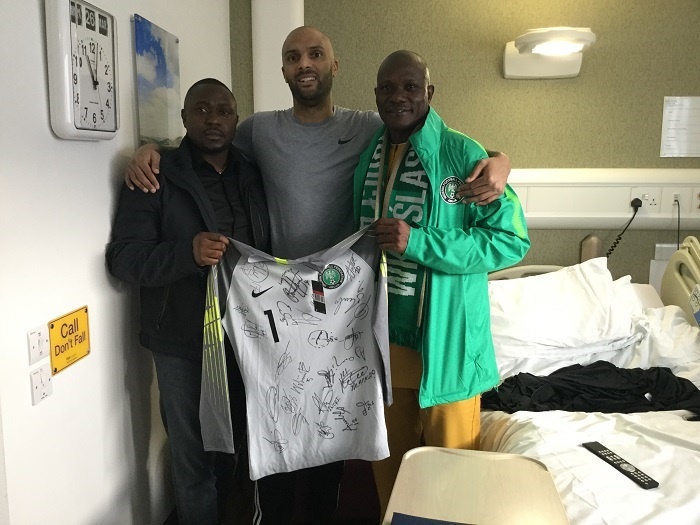 Team Administrator, Dayo Enebi delivered the gift to Ikeme who is presently undergoing chemotherapy, having been diagnosed of acute leukemia. Enebi disclosed that the Super Eagles players would have loved to visit Ikeme in person but were held back because of the game ahead of them. He said: “On behalf of the team, we want to reassure you of our love. The entire team would have been here to see you if we were not playing against Serbia. Coach Gernot Rohr, the technical and backroom staff are all praying for your speedy recovery. An ecstatic Ikeme, moved by all the kind words, responded: “I am so overwhelmed by this show of love. I am indeed grateful to Nigerians who daily flood my phone with prayers and well wishes. "I feel their love everywhere, everyday, on social media. I thank the Government of Nigeria and the NFF for all the support and I appreciate my teammates so much for being there for me". Ikeme has been out of action for almost a year now.